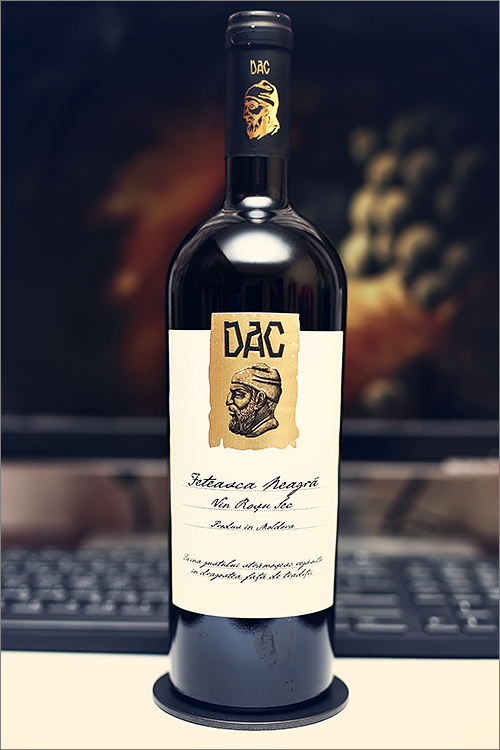 Tonight we are going to review a 100% indigenous wine – Feteasca Neagra 2014 from Vinaria Dac. It is made of feteasca neagra grapes – a famous local variety, which is in high demand in the last couple of years. Although feteasca neagra wines exploded to its full potential in Romania, winemakers in Moldova are showing signs of improvement with every new vintage, displaying great promises and ambitions of producing wines of the highest quality. But enough theory, let’s move on to the tasting. Deep but not opaque ruby color, with shades of ripe pomegranate towards the rim. The nose is rich, filled mostly with red fruits flavours: sour cherry, overripe red cherry, , red paprika, red bell pepper, dried cherry, dried cranberry, red currant, cranberry and some hints of overripe pomegranate. An instant later comes secondary and tertiary notes of red pepper, nutmeg, roasted oakwood and some hints of chocolate. The wine is medium-dry, with high alcohol level, strong acidity and smooth tannin. It tastes lean, wide and opulent, with a nuanced fruit-forward profile and a medium body. This is light, crisp and a bit angular wine, as it is a bit too aggressive on acidity. The wine has a fair overall balance and a quite nuanced fruity accent. It has a medium finish and a balanced, a bit acrid aftertaste. This is definitely a fine Wine of Moldova and the overall rating says the same, with 89.1 points scored it is right there, among the best wines we’ve tasted so far. Please click on the chart icon on the left in order to get to the wine rating page, where you can find all the wines we’ve tasted to date. Conclusion: this is a wine yet too young to drink now, as we believe it is at least 1 year away from reaching its peak form, thus additional bottle ageing is highly recommended. The wine feels a bit unbalanced at the moment, with overwhelming acidity and shy tannins. We would recommend to pair this wine with high-protein dishes dressed in sweet wine sauce, like for example a medium rare steak with tomato and pepper sauce.